As with all businesses and industries, there are many terms used in interior decorating that you may be unfamiliar with. One very common term you will see is “railroading”. But what, exactly, does it mean? Railroading refers to the way a fabric, usually a pattern, is milled. Normally a bolt of fabric features the top of a pattern going up the roll. However, a railroaded fabric will have the top of the pattern going across the roll. This provides a continuous roll of the pattern, making it possible to upholster a large sofa, headboard, cushion or draperies without creating seams or a break in the pattern. For example, with most striped fabrics, the stripes run vertically on the roll of fabric. If you’re upholstering a couch, you would probably want the stripes to run vertically as well. You could piece together several widths of fabric and match up the stripes, but if you want a continuous piece of fabric without seems, railroaded fabric is the way to go. 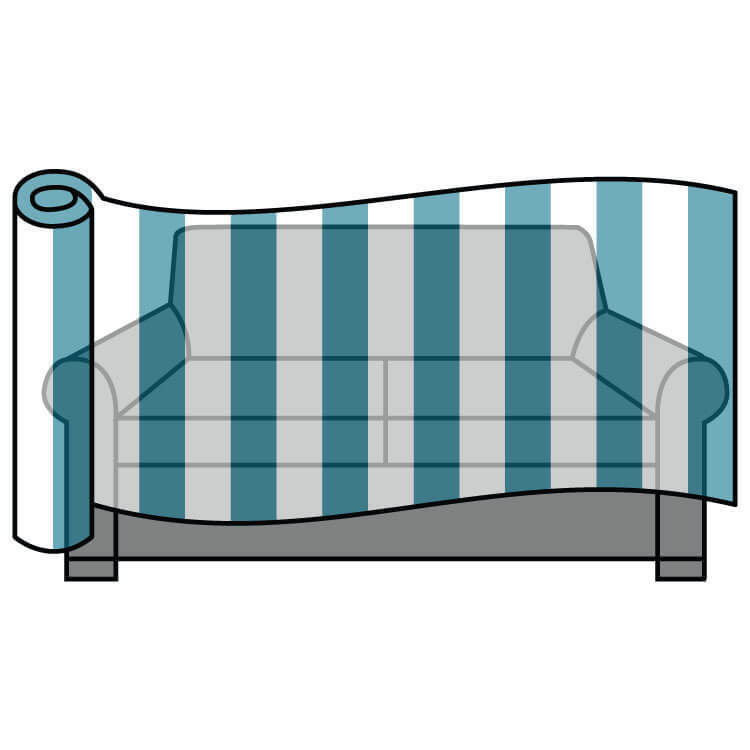 On a railroaded fabric, the stripes would run horizontally so when you turn the fabric to run across the length of the couch, the stripes would then be vertical. Most upholstery fabrics are 54-60″ in width and can be purchased by the yard. If you are choosing a railroaded fabric it may be necessary to purchase additional yardage. Be sure to talk to your upholsterer before ordering. Not all fabrics are railroaded. Solid fabrics without a nap like cotton, vinyl and leather and small patterns may not require railroading. 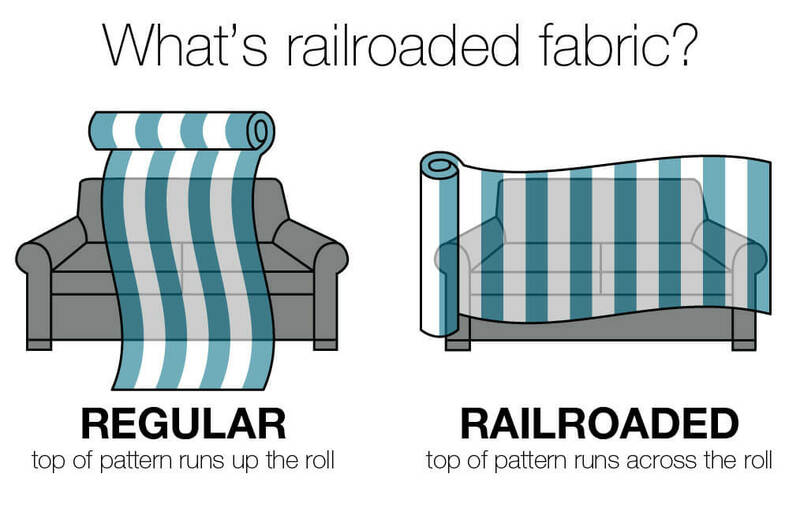 However, large patterns, stripes and fabrics like velvet and chenille that have a nap often work better if railroaded. How can you tell if a fabric is railroaded? If an information tag is attached to the fabric it will indicate whether the fabric is railroaded or not. If there is no tag, roll the fabric out from left to right and see which way the pattern is facing. If the top of the pattern is facing up the fabric has not been railroaded; if the top of the pattern faces sideways the fabric is railroaded. When ordering fabric online, if it is a railroaded fabric, it will say so in the product details. This can all sound a bit confusing but once you become familiar with why a fabric is railroaded it will make more sense. If in doubt, check with your upholsterer, the fabric store employees, or customer service. Looking for upholstery fabric? Shop our great patterns here. That was great information. Ok , I loved a fabric and I want to use it to re-upholster my long cushion 65" which is more than the width of the fabric 54" ! , so , my Question is:- can I Have seem on both sides 12" each side, mind you it's a print fabric !? BEST ANSWER: Yes, if it's not railroaded, you'll have to seam the fabric together with equal amounts on the side. We have a couple tutorials that include how to match up a pattern. Wouldn't it be easier to say that the pattern/stripes run either the length of the fabric or it runs across from selvage to selvage? A railroad pattern runs from selvage to selvage, correct?